First-person role playing games on the PC have problems nobody talks about, a surprise given how much gamers complain. For all the wonder and promise of titles like Skyrim, players spend most of their actual game time drunkenly steering horses around trees or aiming arrows at targets using mechanics virtually identical to those found in a space marine bro-dude combat shooter. FPS fans may be fine with this, but role playing game aficionados have been forced to look far afield, dabbling with consoles and handheld devices, to find the innovations and alternatives that were once commonplace in PC RPGs. In an effort to show modern gamers another way to slay a beast, Finnish developer Almost Human Ltd. has gone back to computer gaming's golden age, examined the work of the genre's progenitors, and emerged with their debut title, Legend of Grimrock. Keep plenty of food around if you have a Minotaur in your Legend of Grimrock adventuring party. 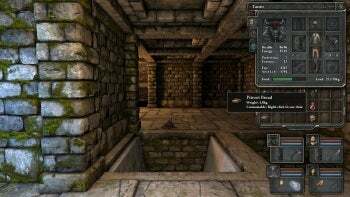 Using the traditional Dungeon Master interface, Grimrock reintroduces grid-based step movement and ninety-degree turns to first-person roleplay. After over a decade of Unreal-style mouse-look "walking simulators," this design decision feels less retro than revelation. Each click on the directional arrows or tap of the WASD/QE keys moves your party a square or turns them 90 degrees. Although you can examine areas in detail using the right mouse button, your party always remains at a fixed distance from the scenery. No more blurred textures because your nose is pressed against a wall. No getting 'stuck' on scenery geometry or wrestling with exacting positions to do something as simple as opening a door, either. Everything just works, and looks great doing so. Legend of Grimrock's simplified motion controls allow for other mechanics to take center stage, so you spend less time thinking about avoiding door jambs and more time thinking about party tactics during combat or pondering the environmental puzzles, which are a fiendishly difficult mix of pressure plates, teleporters, switches, hidden buttons, spell attacks, pits and more. Things get tough in this regard, in particular after level 5 or so. You create spells by combining rune symbols into formulas you find or figure out on your own through trial and error, although the character must be still be sufficiently skilled in that school of magic to cast the spells they discover. Character types are differentiated by both class and race, with humans, insectoids, minotaurs, and saurians each offering their own particular set of advantages and drawbacks, as well as fun portraits that provide personality and help get you attached to your rag-tag band of deep-dungeon survivors. Legend of Grimrock limits classes to a choice of fighter, rogue or mage, although unique skill sets allow for diversification. The game tends to reward specialists over generalists, so pick primary and secondary skills wisely and stick to them. Mant's exoskeleton perk provides natural armor protection. Combat is real-time and cooldown-based; each member of the party attacks when you click the weapon or spell they have ready at hand and that character is then greyed out for a short time while the action is performed. Two rows of two characters each allow positional tactics to be meaningfully utilized. Characters in the back row are protected by those in front, so mages and rogues are largely shielded from the effects of combat while they cast spells and use missile weapons. This also permits injured fighters to retreat to the relative safety of the rear row if combat is going poorly, where they can be healed or attack from a distance with long weapons such as spears. Just keep in mind the same tactics can be used against you just as effectively. Once your party is cornered or surrounded, it's almost always the end of the road. Legend of Grimrock is unforgiving, so save often. The only obvious problem here is length. Grimrock is so good that ten dungeon levels just aren't enough. Fortunately, the team at Almost Human Ltd is hard at work on several planned expansions, the first of which is a free level editor that's destined to create a world of user-generated content, and custom portrait packs made by fans are already popping up on modding sites. At just $15 DRM-free and direct from the developers, Legend of Grimrock is the most wholehearted recommendation to role playing fans since Diablo 2. The buzz you're hearing about these guys is only the start. Grimrock is going places. Legend of Grimrock takes Dungeon Master's route to greatness.